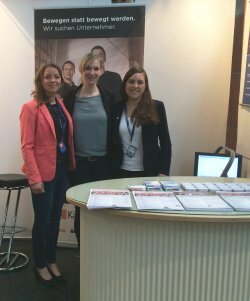 Käuferportal took part in this year’s Connecticum job fair, which ran from 26th to 28th April. The goal was to make final-year students aware of us and to position Käuferportal as an attractive employer alongside brands such as Unilever and Microsoft. As a fast-growing company, we are becoming more and more dependent on well-educated professionals. In addition to established portals such as the German jobsite Stepstone or mailing lists from the university, we now want to increase our presence at job fairs. We therefore started at the end of April at Connecticum 2016 – one of the biggest graduate fairs in Germany. Over 400 firms, some internationally active, are represented there each year with the aim of engaging in dialogue with final-year students and young professionals. Käuferportal presented itself here alongside large employers such as Microsoft, Deutsche Bahn, Telekom, Amazon, IBM and Volkswagen, and proved that it could play in the big league with its 350 employees and 4 locations in Germany. “Our goal is to actively implement Käuferportal as a brand in the graduate target group”, says our recruiting manager Lydia Conrad about Käuferportal’s ambitions. And the crowd was huge. Half-hour interviews with our HR team had already been booked in advance and there was much to discuss at the fair itself: What comes across well in job interviews? How should an application portfolio look? Which positions are currently open? What does the application process involve? Many interested attendees left their CVs with us, which HR then carefully studied over the following days. “We want to use our presence at the fair to fill vacancies with curious applicants, people who want to be a part of our success story”, says Lydia Conrad. Anyone who is interested in our positions can of course write to us directly or visit our careers page. 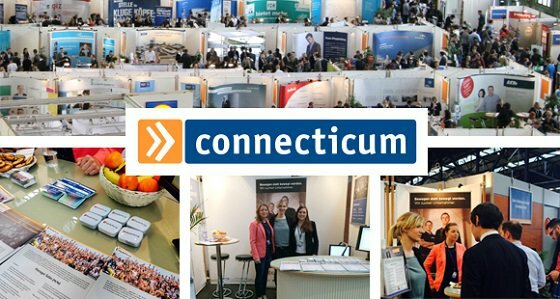 Connecticum takes place each year in Berlin at the end of April and is geared primarily towards IT specialists, engineers and business professionals. The fair allows contacts to be made, questions to be asked regarding the application process, and spontaneous interviews to be conducted in a relaxed atmosphere. The next fair will take place from 22nd to 29th April 2017. © 2008 - 2019 Beko Käuferportal GmbH. All rights reserved.